The average home today contains more toxic chemicals than the average chemistry lab at the turn of the century. According to the EPA, there are over 150 toxic chemicals in your home that are 3 times more likely to cause cancer than any other cancer causing factor. I could go on and on with these kinds of facts, but I think most people get the picture. So many of us think we need to clean our homes with harsh, toxic chemicals in order for it to be clean. I was one of these people, using things like Clorox with bleach and lysol, until just 3 or 4 years ago. Simply because I didn't know better. I think there's an issue with education about natural cleaners. People seem to be afraid that they aren't effective. In most cases, natural cleaners are the better choice, there are some instances where you do want to use bleach, like in the event you have mold. Bleach is one of the only household materials regulated by the EPA. The EPA does clearly state warnings on the label (eye, nose, skin, and respiratory tract irritation). And unfortunately, it is cancer-causing; it releases dioxin and mercury. So you only want to use it in extreme cases. Fun fact about me: I have had the same spray bottle of Clorox w/ bleach since I was a sophomore in college. I only use it when I have to clean up after someone who has gotten sick..... or if I have to kill a spider. 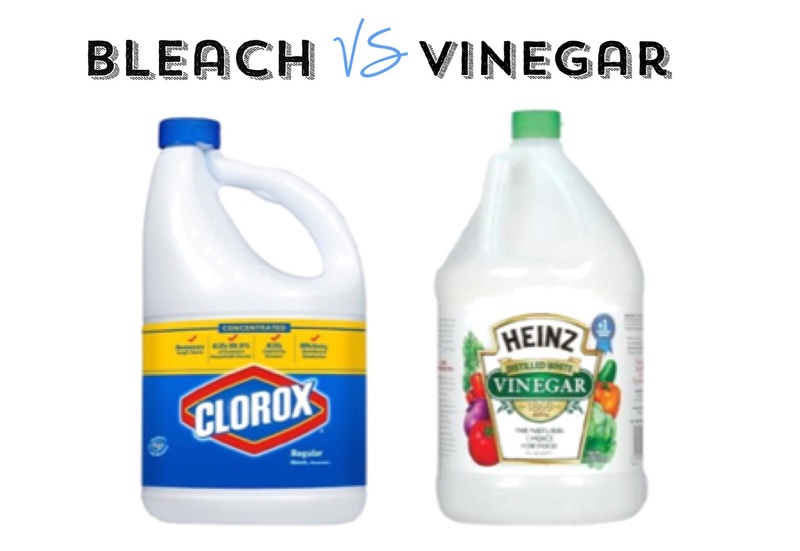 Price-wise: bleach is about a dollar more than vinegar. That's not a huge difference, but most people don't buy just a container of bleach. Most people buy all the different spray bottles that come in different scents and the ones that advertise how they serve all these different purposes. People end up spending a lot more. Keep it simple, skip all the marketing ploys, stick with vinegar. Remember, your home is not a hospital. We actually need exposure to some pathogens. Having a 100% sterile home is only going to put you at more risk for illness because your immune system won't be getting any practice. So, in short: Vinegar doesn't kill as many bacteria or microorganisms as bleach, BUT it is perfect for everyday cleaning. You can play around with the soap and use Dawn dish soap with essential oil drops instead. That is another favorite way to make cleaner - I like to use lavender essential oil. Homemade cleaners make my house smell and feel so fresh. I always feel like using chemicals to clean gives off a "fake" vibe because you walk in and all you smell are chemicals. I prefer to walk into my home having it smelling crisp and natural! Yum! What are your favorite ways to clean naturally?